THE art of cooking is a broad landscape that should be explored and chef Justin C.K Hor from Oriental Group of Restaurants is bent on making his mark. He was tasked with creating an interesting menu for the group?s latest restaurant, Noble Mansion, in Plaza 33, Petaling Jaya, which exudes romance and luxury. The black walls and fine wood finishing add to its rustic charm, which is divided into three sections ? banquet hall, courtyard and terracotta. Both the courtyard and terracotta sections have private rooms that are furnished with karaoke systems. ?Oriental Pavilion at Jaya 33 next door has reached its maximum capacity, so we wanted to capture the spillover here. ?However, we did not want a Siamese twin and so, we created a new concept,? said Oriental Group of Restaurants chairman Datuk Phillip M.C. Siew. Hor bore the difficult task of matching his dishes to the beautiful setting and has emerged victorious with his Shunde-inspired recipes. Shunde in Guang Dong, China, is the birthplace of Chinese Canto cuisine. The place is fertile agricultural land and the chefs are experts in poultry, vegetables and river fish dishes. The team from Oriental Group travelled extensively to find the perfect dishes to serve their loyal customers, and Hor has injected his own ideas into ala carte dishes on them menu. One of the must-haves is the Roasted Chicken with Sesame Shunde Style. He recreated a typical fried chicken dish with a Shunde must-have ? sesame seeds. ?I do not like to just copy a recipe. 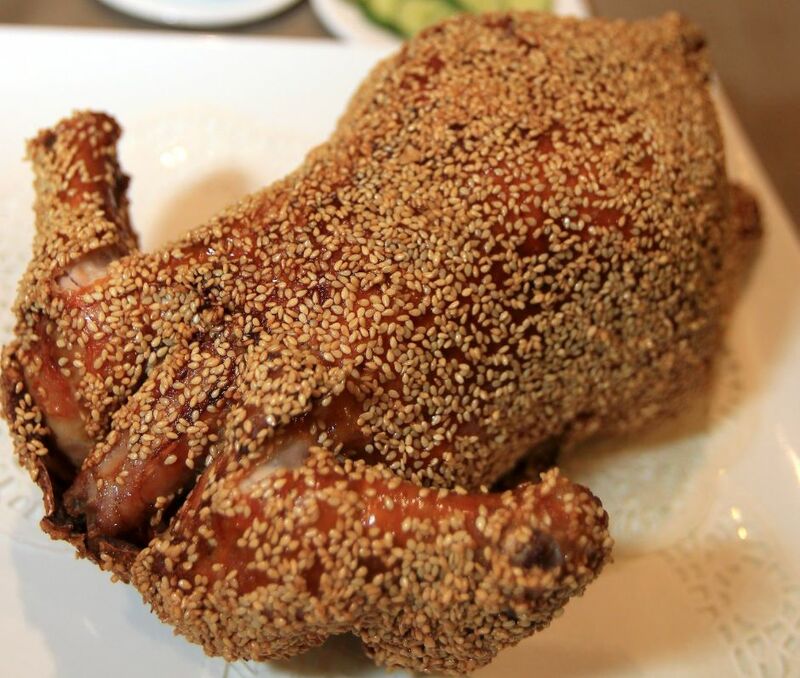 I love to throw in new ideas into it and so I coated the entire chicken with sesame seeds,? he said. The waitresses carved the skin dotted with sesame seeds delicately and placed it inside a thin wrap with cucumber and bean paste sauce. The result was a delicate crispy filling, cucumbers adding a crunch in each bit. Next on the menu was scrambled eggs with fish maw and fresh crab meat served in lettuce. A difficult dish, this smooth textured delicacy requires a high degree of culinary skills to perfect. The fluffy eggs complete the sweetness of the crab meat and tender fish maw. Hor has also introduced another Shunde specialty ? frog meat. In Shunde, frog meat is served simply as a sizzling dish but here, Hor has decided to add in a Malaysian favourite ? abalone. The Sizzing Abalone with Frog meat Shunde Style is a flavourful dish. The frog meat was well seasoned, soft and juicy with a hint of spice. Also on the menu was the Roasted Suckling Pig with liver sausage. A staple in the Chinese community, the suckling pig was both easy on the eye and the palate. The crispy skin was served on a small spoon filled with the pork belly wrapped around the liver sausage. Crispy on the outside and juicy on the inside would be the most apt description for this dish. The people of Shunde are famous for their steamed river fish. However, Hor was not about to serve something as simple as that. He decided to throw in some preserved radish, a homemade recipe where radish is preserved in chilli, vinegar, soya sauce and seasoning for three days. ?The fish is firm but smoother. What you get is juicy meat coupled with the slightly spicy radish,? said Siew. Finally, the Two Variety Rice with Scallop, Razorback Clam and Crab Meat in Superior Crab Soup was served. The dish is actually a soup with plain white rice and deep-fried sun-dried rice puffs. Crab-shells are boiled with the soup for more than six hours to form the base while the clams and rice are added just before serving. For dessert, Hor has introduced a new item on the menu, Chilled Sweetened Fuji Apple with Snow Jelly, Gingko, Fresh lily and Red Dates. The inside of the Fuji apple is removed and the ingredients are served inside the shell of the apple. The rich flavour of the apple blends well with the ingredients and is a great way to end the meal.